A compact, lightweight tiller that delivers big tiller power. 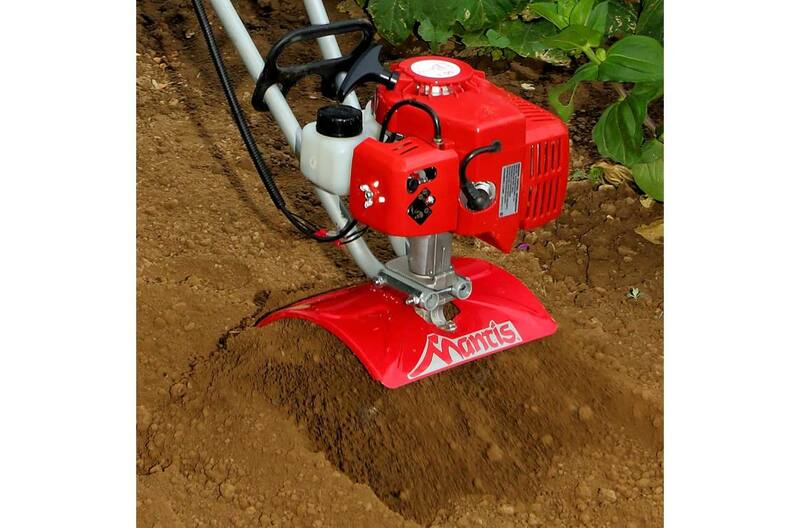 The Mantis 2-Cycle Tiller/Cultivator weighs just 20 lbs. This mini tiller breaks through hard packed sod and clay faster and easier than using a shovel. Digs perfect planting holes for new trees and shrubs. Turn the tines around to the cultivating position and speed-weed the garden. Compact enough to use near established plants or along fences and walls. Lifts easily into raised garden beds. Soft, flared grips are designed for comfort. Flush-mounted throttle with a palm-controlled switch for infinite speed control and easy operation. Reliable Easy Starting Engine: Commercial-grade two-cycle (gas/oil mix) engine features push-button priming for quick starts. Innovative Transmission Design: Gear design and specially designed tine geometry generate maximum speed for digging and cultivating. Delivers maximum performance with minimum weight. Soft, Sure-Grip Handles: Designed for maximum comfort in any conditions. Flush-mounted throttle for optimum speed control. 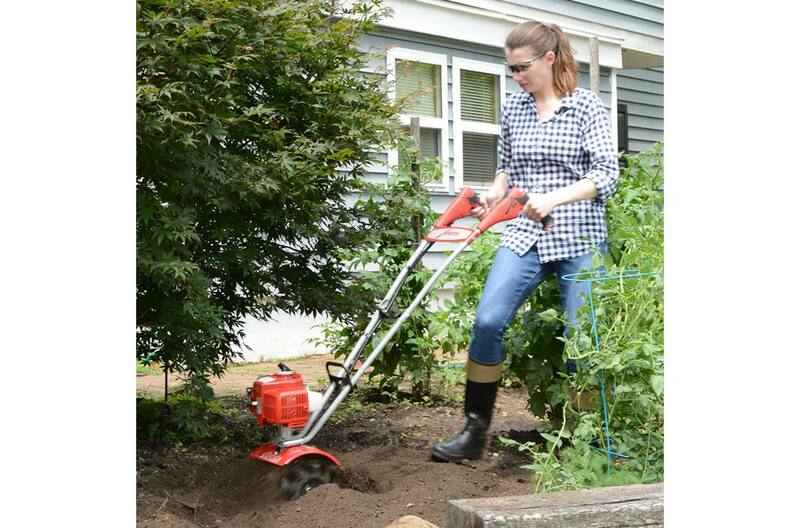 10" Tilling Depth: Till up to 10” deep with the Mantis Tiller/Cultivator. Create a better planting bed; the foundation of healthier plants. Fold-Down Handles: For conveniently storing the tiller or taking it to the community garden. 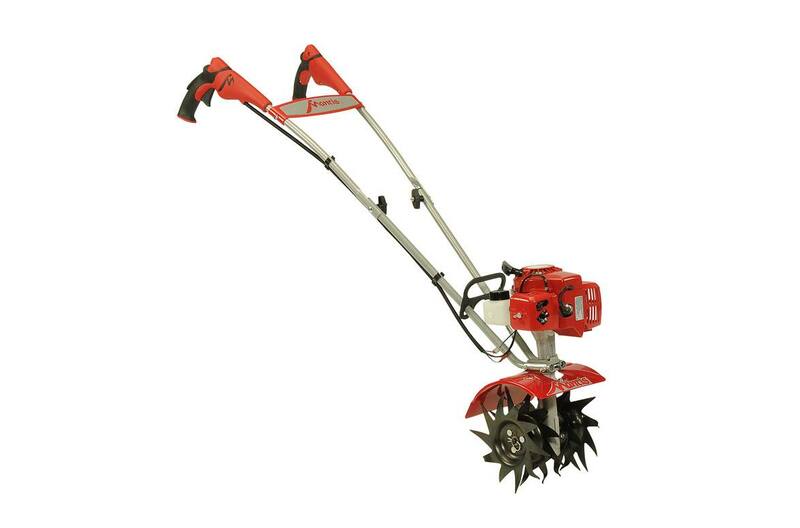 Compact Size: The Mantis Tiller/Cultivator 7920 is only 9” wide. Use in tight spaces where big tillers can’t go. Weighs only 20 lbs. Easily lifts into raised beds. Uniquely Designed Curved Tines: Mantis Tillers dig deep even in hardest soil and clay, instead of bouncing around like other mini-tillers. Tines are guaranteed for LIFE against breakage. If one of them ever breaks, we’ll replace it for free. No matter how long you’ve owned your tiller. Versatile: Turn the tilling/cultivating tines around and go from tilling to cultivating and power-weeding. Optional lawn care attachments for lawn aerating and removing thatch; install in just minutes.